I took these photos in a random alleyway while shopping on Valencia Street yesterday. One thing I love about San Francisco is that there are hidden gems all over the city. Gems as in stores, restaurants, and places to take really interesting photos. This whole garage door with an embedded door was too interesting to pass up and not use as a background. The black also ended up contrasting pretty well with my red pants that I’ve been living in the past month ever since I hemmed them (first worn here). I used to habitually alter my clothes and recently started doing it again. I forgot just how much of a difference alterations can make! It really helps increase the longevity of your clothes too. Love that cute polka dot print on the chambray shirt! looking super stylish 🙂 the red jeans match the polka dotted top perfectly! Love so much this look, shirt and pants are perfect together! those polka dots are sooo sooo cute! I love the large polka dots on your GAP shirt, it looks great with the red pants! love those red skinnies! xO! I am so in love with your top! You chose the perfect accessories to go with it too! Absolutely lovely look! I totally adore everything about this look! The leather jacket, denim polka dots, red bottoms, and how the hem is oh so short enough to showoff your cute oxfords! The handbang really ties everything together! 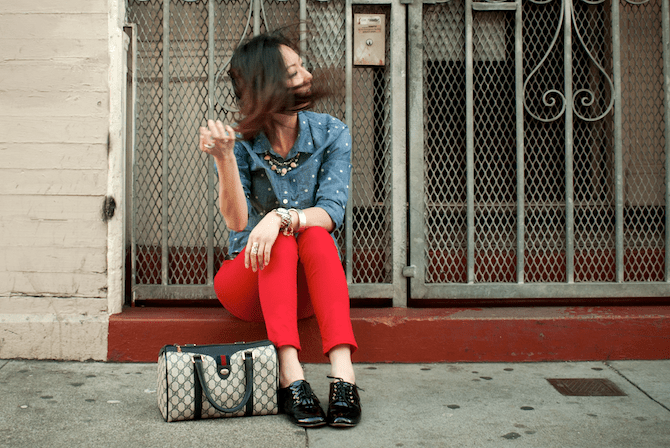 Love the polka dot chambray with the bright red skinnies! So cute! I love this shirt. i saw a guy with it the other day and though i definitely need a one like this also. and the bag OMG the bag!! So cute! The red and the polka dots make such a cute combination! I love that gap shirt! I'm checking out a tote from there tomorrow…I'm going through a Gap phase. such a cute shirt, loved the pairing with red. Thanks so much for ur comment on my blog !already following u with gfc..If u want we also follow on other platforms too !! Great pop of color in your pants…definitely fun! And love your bag! Hope you have a great day and if you get a chance, I would love for you to stop by and check out my PLAY style post. i love this outfit! i love the pairing of all the pieces! Love this outfit! You have awesome fashion. Thanks for stopping by Infinite Style! ooohh i love the red pants! Fabulous outfit, great jacket, btw you have a great blog, want to follow each other ? Let me know ! Really like this outfit, and how bright the jeans are. Would love to follow each other, so let me know on my blog? Love this! The red pants and blue shirt go so well together-it's like vintagy and siren-y at the same time! i really love your top! i'm so obsesses with polka dots! wooow! love your look so much! If u would like we can follow each other and visit our blog , it will be a great pleasure for us to know ur view about our new blog…. Lovely outfit. I really like the location. Would love to go to San Francisco once. Amazing blog! Shall we follow eachother? Thanks for your comment, I'm following you right now! Follow each other? I love your style! Those red jeans would go great with all black and gold too! I love it! Lots of love you are amazing!! !